A valve in which the fluid flow is regulated by a ball moving relative to a spherical socket as a result of fluid pressure and the weight of the ball. a valve in which the seal is effected by a ball. The spherical surface of the ball is pressed against a conical seat that forms the transmission path of a pipe, thus providing a hermetic seal in the channel. 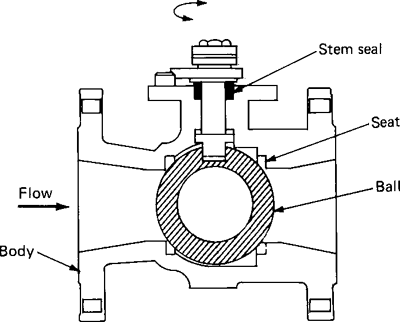 Globular check valves—a type of ball valve—are very common. The ball in such valves is pressed against the seat by the action of a spring or by the ball’s own weight (in the latter case, the seat axis is vertical); the mechanism allows a gas or liquid to flow only in one direction when the pressure of the flow overcomes the force created by the spring or weight of the ball. Globular check valves with solid metal balls are used for inside diameters up to 15 mm; similar valves with hollow, rubber-coated balls are used for inside diameters up to 100 mm. Valves with balls that have a through hole are used as shut-off and regulating devices for inside diameters up to 1,000 mm. Such valves are opened and closed by rotation of the ball through 90°. A valve for regulating the flow of fluids by a movable ball which fits in a spherical seat. Located in Hudson, Massachusetts, the company offers a wide variety of valves, including ball valves, pneumatic valves, inert isolation valves, solenoid operated valves, valve actuators, pinch valves, manifold valves, globe valves, butterfly valves, needle valves, and miniature and subminiature valves. Despite its' old fashion design in some cases impressive durability of Starr-Edwards caged ball valves astonishes investigators and this case is one of them. It's a good idea to fit Polytetrafluoroethylene (PTFE) tape around the thread of the ball valve. Ball valves have taken over the bulk of usage for natural and LP gas, replacing the older plug valves that were traditionally used as gas valves. However, as with other valves, read manufacturers' specifications carefully, as not all high-vacuum ball valves are created equally, With the elimination of gas entrapment, stem seal improvements, and no possibility of virtual leak, the high-vacuum ball valve has proven itself to be a component worthy of consideration for high-vacuum valve selection. A relationship with the community already had been developed by the company's Apollo Ball Valve assembly plant, and the state and local governments were offering tax and employment credits in addition to reduced electricity rates through a local co-op. The two-way 8FKB ball valve complements the original 6FKB ball valve introduced in May 2009. The specialist for industrial valves AS-Schneider has now expanded its comprehensive product range to the KB and KC Ball Valve Series with a bore size of 14 and 20 mm. Metallized Carbon's carbon-graphite ball valve seats are for use in valves designed to handle hot liquids or hot gases. All of the 8E Electric Actuated Ball Valve models are direct mount. ball valve producers has opened a wholly owned subsidiary in Houston, known as Microfinish Valves, Inc.